The Home Office finally granted my visa. This gives me permission to enter and leave the UK for the rest of my life. 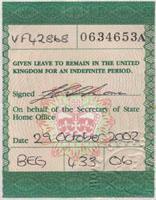 The next (and final) step is UK citizenship, something I can apply for in one year.